A practical vest lightweight, durable with a host of storage for the avid fly angler. 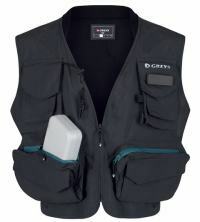 Keep all your fishing essentials secure and close to hand with the new rigorously tested Greys Strata Fly Vest. They've made the vest itself as light as possible, using highly durable and quick drying fabrics, and maximised flexible storage for unimpeded fishing.